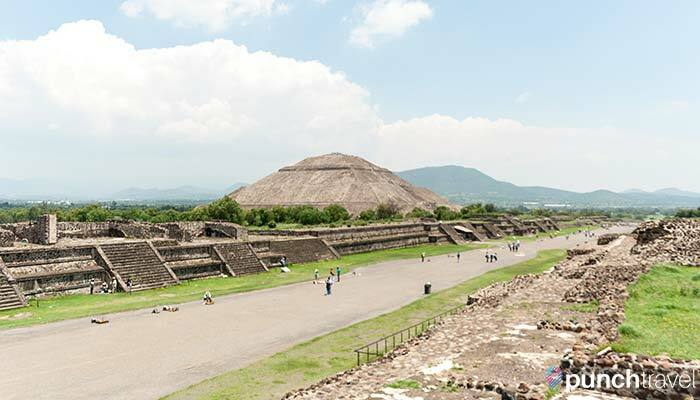 Teotihuacan was an ancient Mesoamerican city, and a site of great religious importance to the Aztec people. 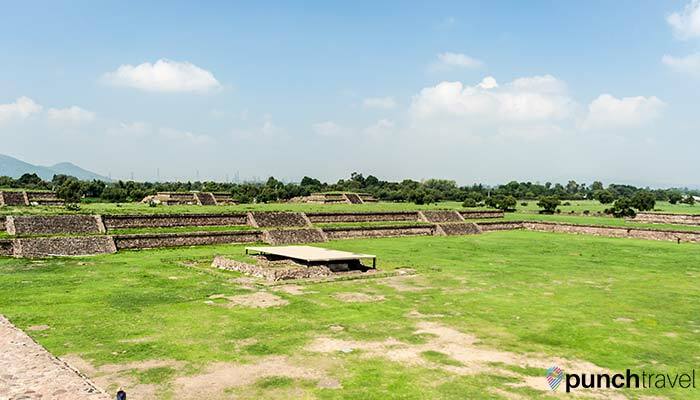 Today the archaeological zone is the most visited attraction in Mexico. The pyramids and dwellings that comprise the site are preserved in remarkable condition and most are open to visitor access. The entire archaeological area has a massive footprint that spans 11.5 square miles. The main thorough way is Calle de la Muerte, or Avenue of the Dead. The two-mile path begins in agricultural land and continues past the Citadel and the Pyramid of the Sun, before ending at the Pyramid of the Moon. The archaeological zone is open daily from 9:00am to 5:00pm. Admission is 65 pesos. The three main pyramids at the archaeological zone are: Pyramid of Quetzalcoatl, Pyramid of the Sun, and Pyramid of the Moon. Several smaller plazas and temples fill the surrounding area. Entering through Puerta (Door) 1, the first area is known as the Citadel. It is a large sunken square with plazas and platforms situated around the border. It served as the city center, and its size was chosen in order to accommodate large festivals and ceremonies. 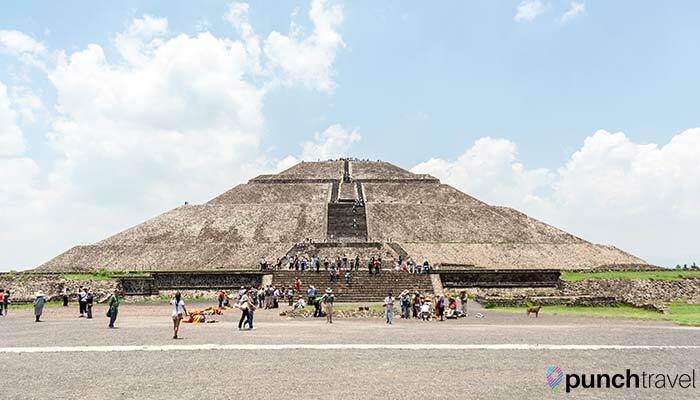 Within the surrounding wall, the impressive structure at the center is the Pyramid of Quetzalcoatl, also known as the Feathered Serpent or Plumed Serpent. The pyramid is sometimes referred to as a temple, in reference to the temple that once stood at the top of the pyramid. Unfortunately the temple, and most of the other temples that used to exist within the archaeological zone, have not survived to present day. To view the pyramid you must first climb up the platform in front of it, called the Adosada platform. The steps are steep, narrow and there are no railings or supports. 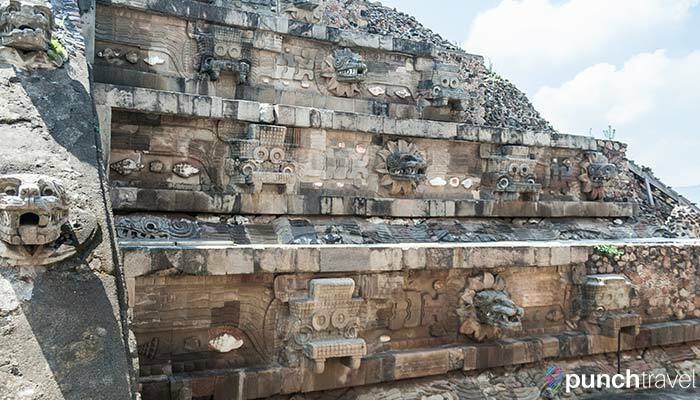 Once you’ve made it to the top of the platform, the Pyramid of Quetzalcoatl and its impressive stone carvings of the god Tlaloc can be seen. The stone serpents are in excellent condition and the remnants of the once brightly-colored faces are still visible. 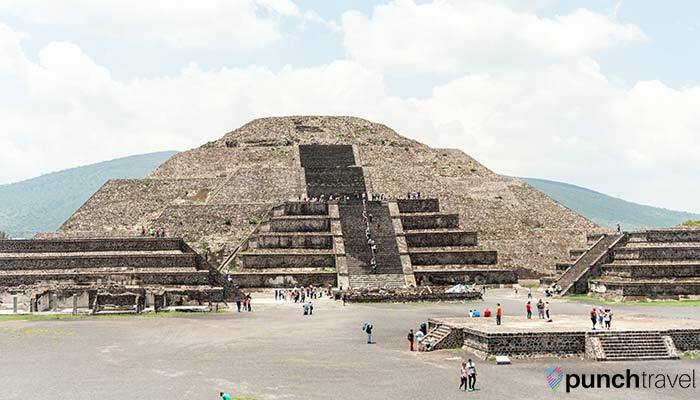 The next pyramid, the Pyramid of the Sun, is the largest pyramid in the archaeological zone of Teotihuacan. At 210 feet in height, it is the third largest pyramid in the world. It consists of four platforms and a base of 8,555 square feet. At the top of the main platform, take the time to walk around to the back side of the pyramid to revel in the quiet serenity of the vast, remote landscape. The Pyramid of the Moon is at the end of the Avenue of the Dead, closest to Puerta #3. 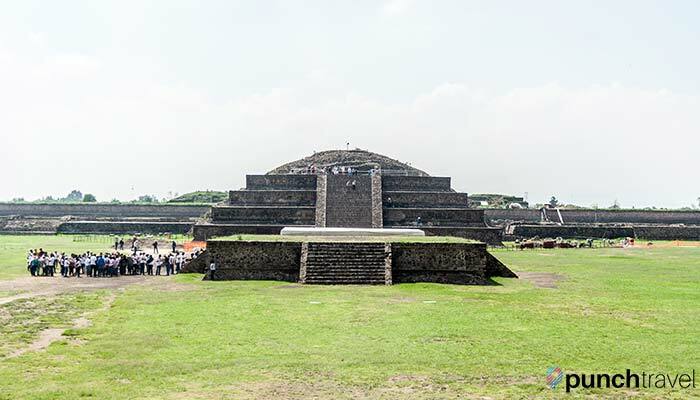 This pyramid is roughly 140 feet high and is the second largest pyramid at the archaeological zone. 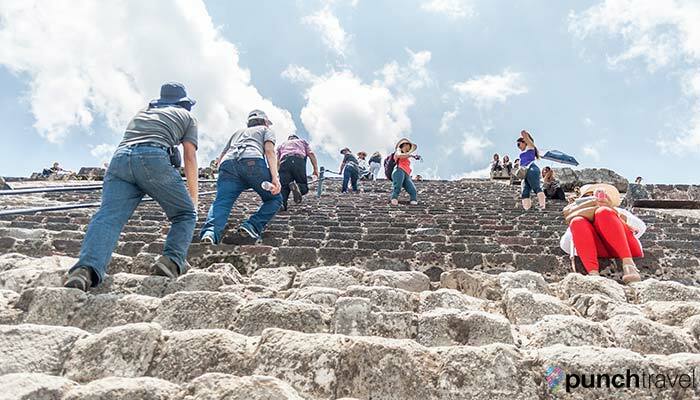 About halfway up the pyramid is a platform which was used for ceremonies in honor of the Great Goddess of Teotihuacan. This is a unique feature of the pyramid, as none of the other pyramids themselves were used as gathering places. In front of the pyramid is a small platform called the Plaza of the Moon, where public ceremonies and ritual sacrifices took place. Surrounding the plaza are several smaller platforms where audiences gathered for these events. 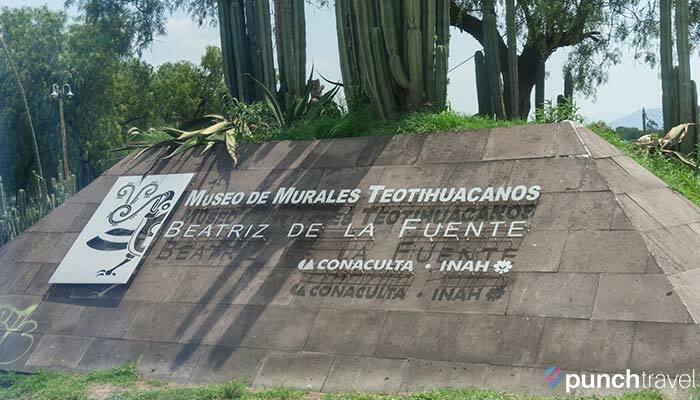 There are three museums at the archaeological zone, and are all included with the price of admission. 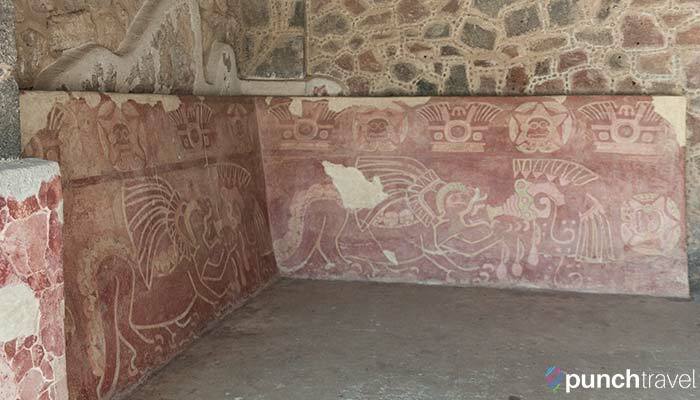 Located about 5 minutes outside of Puerta 3, this museum exhibits murals recovered at the archaeological site. The original city was decorated with brightly colored paintings that covered the building walls. Here in the museum, nine themed rooms showcase these murals and the other archaeological materials excavated from the site. 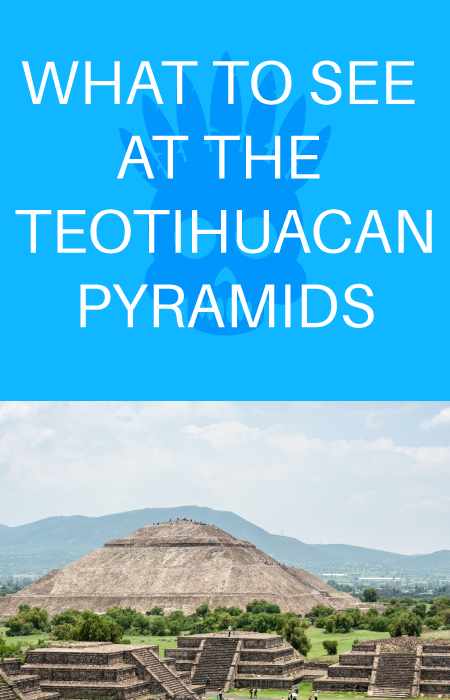 The largest museum at Teotihuacan is the Site Museum. The museum holds an impressive collection of archaeological material uncovered from the area. 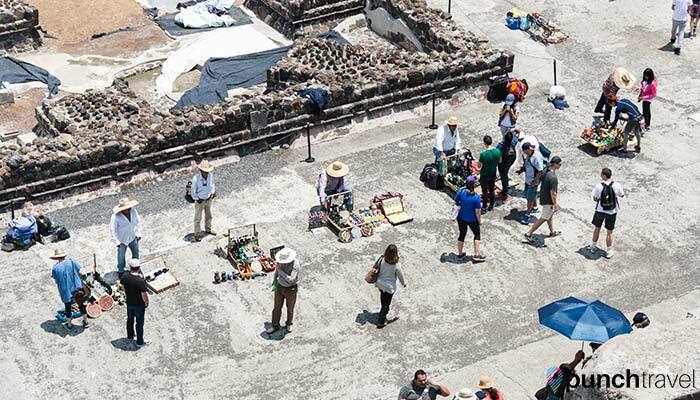 Eight rooms give insight into the development of the culture in Teotihuacan. Exhibits explain how social groups were organized. Recreations of burial sites found under the pyramids provide insight into the religious sacrifices and rituals. The museum also displays instruments of everyday life, including cooking and hunting tools, pottery and artwork made from clay, shell, bone, wood and rocks, and large stone sculptures that adorned the pyramids. 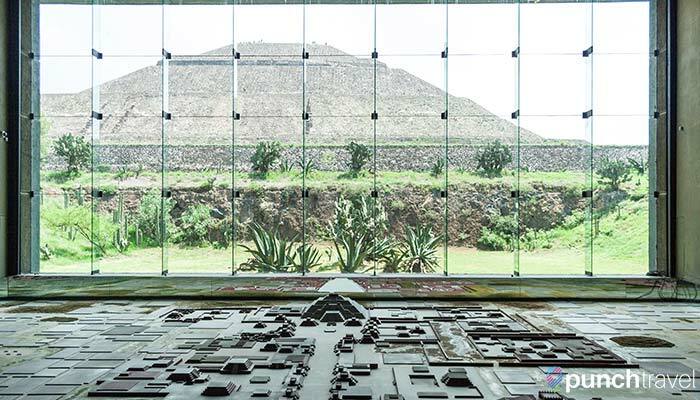 In the center of the museum is a large model of the entire archaeological site and surrounding city. Behind it is window looking onto the Pyramid of the Sun. 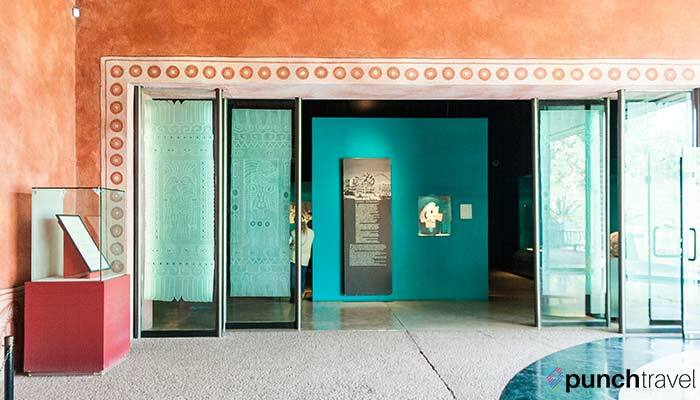 The Museo de la Cultura de Teotihuacan is located immediately after entering through Puerta 1. 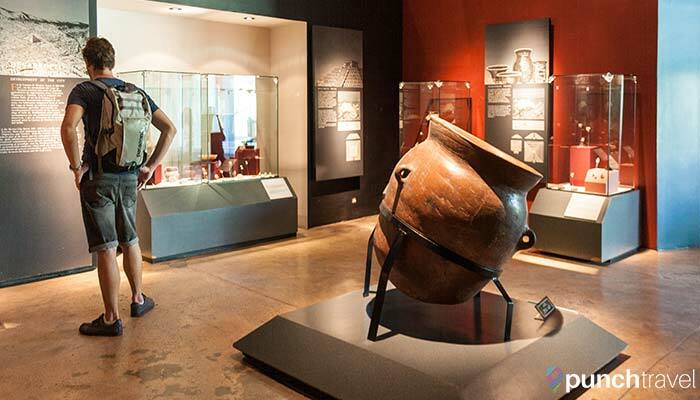 The museum provides an introduction into the types of artifacts found at the archaeological zone. Unfortunately none of the placards in this museum are in English. 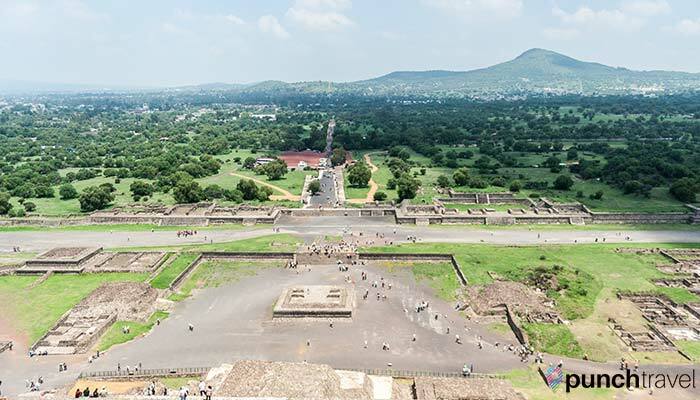 Next to the Pyramid of the Moon are a few palaces and dwellings to view how the ancient Aztecs lived. The Palace of the Jaguars is immediately west of the Pyramid of the Moon. 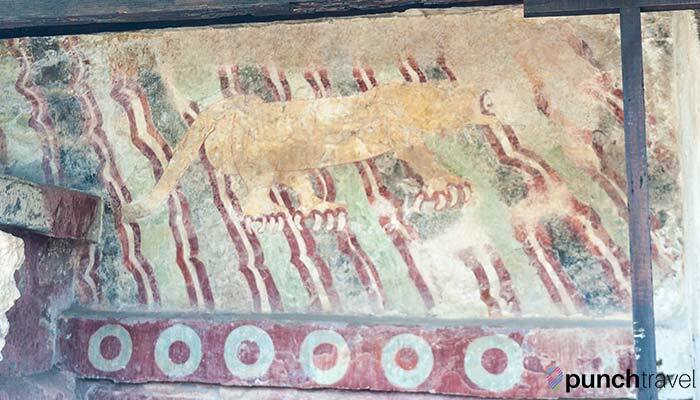 The jaguar is an important symbol in Aztec culture, and the Palace of the Jaguars is one of the most meaningful temples of the sacred city. 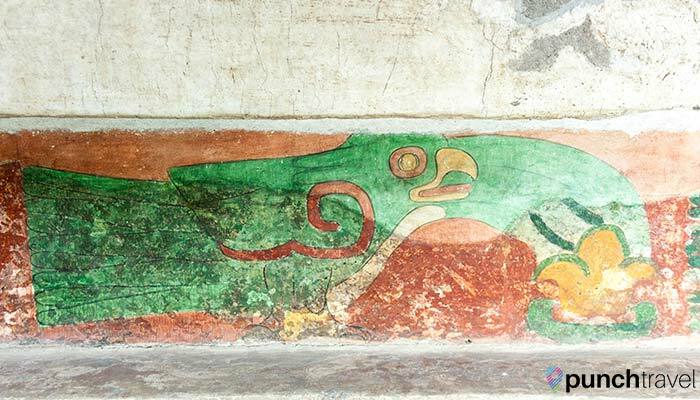 The palace has an expansive courtyard and the remains of murals featuring jaguar and ocean elements. Next to the Palace of the Jaguars is the Palace of Quetzalpapalotl. It was believed that Quetzalpapalotl was a mythical creature that was a cross between a butterfly and a bird. The palace has a large, square patio that is lined with columns decorated with bird and butterfly motifs. Connected to the palace is the Temple of the Feathered Conch Shells. Here, murals with colorful birds are pictured pouring water. Floral and nature motifs line the pillars within the temple. Outside next to the palaces are the remains of a typical Teotihuacan city dwelling. Only the foundation is left but it provides insight into how the ancient people lived and the early innovations they achieved. Throughout the entire area, vendors are lined up every 5 feet selling souvenirs. They will follow you, offering to show you their obsidian figurines, ornamental skulls, and noisemakers. A simple no thank you should get them to leave you alone. If you do want souvenirs, it is a good idea to buy them at the pyramids, because they are cheaper than you will find in Mexico City. Items cost as low as 10 pesos. 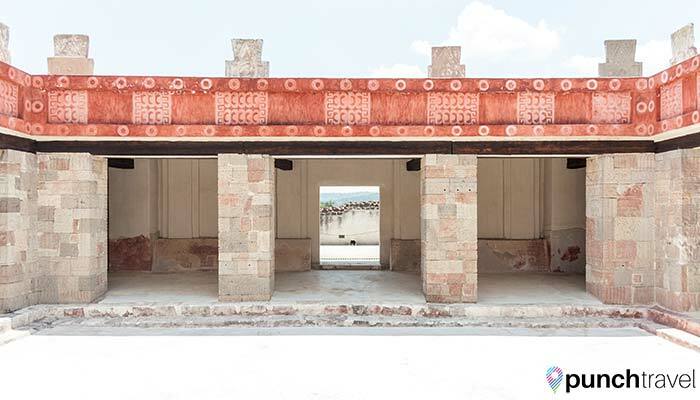 Bathrooms are located throughout the archaeological site, and are free to use, unlike some public restrooms in Mexico. There is no food sold on the premises, save for a few vending machines. If you want a full meal, head outside Puerta 2 for the most food options. Re-entry is permitted. There are also picnic areas within the archaeological site where you can eat your own food. Entrance to the archaeological site is free for Mexican citizens on Sundays, so expect it to be busier than other days of the week. There is almost no shade to be found, so load up on sunscreen and wear a hat! Hats and sombreros are also sold at the gift shops at the entrances.